Being better is not forbidden, certainly not at all in the Müller-Guttenbrunn Group! The Müller-Guttenbrunn Group has been working on the development of the recycling of some engineering plastics such as polycarbonate, PC / ABS or polyamides for some time. For the success not only extensive experiments, technological leaps or new, modern plants are necessary … „We do not pursue a strict structure, as in our company innovation is a constant quest. The ideas of our employees opening new doors to the adjacent possible, our abilities to try out new approaches building upon earlier innovations and our contacts and communication with the scientific world form the pillars of our innovative performance „, explains Günther Höggerl, responsible for research and development in the Müller-Guttenbrunn Group (MGG). At the moment, plastics’ recycling is in the focus of new recycling ideas. 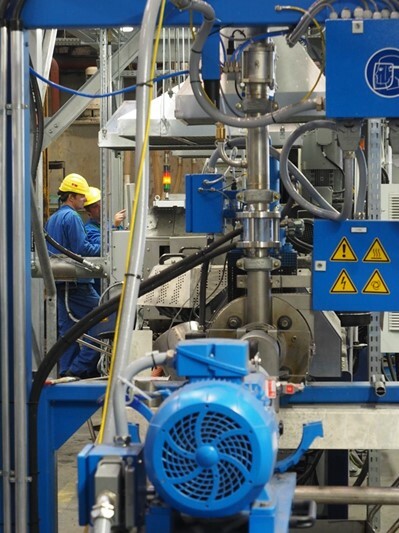 As a pioneer in the recycling of plastics from complex waste streams, Müller Guttenbrunn has been able to separate polymers such as PP (polypropylene), ABS (acrylonitrile-butadiene-styrene) and PS (polystyrene) with the company MBA Polymers for over 10 years and markets compounds of these Post-Consumer Recycled plastics back in the market of durable goods such as electronic products. This means that up to now half of the plastics in the e-scrap can be recycled as secondary raw materials. 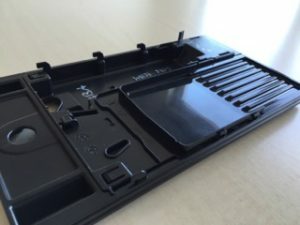 With the accumulated experience and the know-how of recent years, the next adjacent possible step is the separation of other plastics, both from the e-scrap and from other waste streams. On the other hand, considering the technological challenges on the one hand and efficiency considerations on the other, it was clear that the separation of all existing plastics types from the E-Waste stream could not be envisaged. The focus was set. The joint teams of the MGG companies Metran and MBA Polymers in Kematen decided to concentrate their efforts mainly on designing separation processes for the plastics PC (polycarbonate), PC / ABS (polycarbonate / acrylonitrile butadiene styrene) and polyamide. The separation processes are mainly based on the information from the electromagnetic spectrum of the wavelength and have been brought to production maturity in long cooperation with manufacturers and with additional knowledge from for example from the mining industry. „A proverb says: Many roads lead to Rome. So we often have several ways to get there. 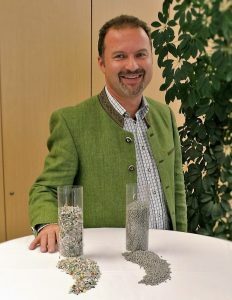 Each option offers its own advantages and disadvantages,“ says Günther Höggerl, referring to the different recycling methods used in Metran and MBA Polymers. The technology used at Metran is flexible, can recognize different types of plastics and separate them if necessary. However, it reaches its limits with dark plastics. In the neighboring plant, MBA Polymers, the applied separation technology can also separate dark plastics. However, this process is deliberately optimized for the separation of a certain plastic type and grade (PC / ABS). 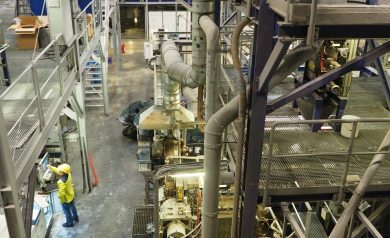 Just like in many innovations within the Müller-Guttenbrunn Group, these two different approaches complemented each other in their sum, thus enabling meaningful and economical recycling in the end. One of the greatest advantages for recycled plastics is their much better ecological balance. An important point when it comes to keeping the environmental impacts as low as possible. A study conducted by a Swiss institute specifically for the plastics recycling of the MGG shows that the recycled plastics are 6 to 10 times more ecologically superior to new plastics (see also Study – Link). But we are not yet this far. Many companies still strongly rely on the use of virgin materials and many producers are still reluctant to use these PCR plastics. In some cases this is the case because of product requirements, but in most cases because of the low confidence they have in the material properties and the reliability of the supply of these recycled plastics. "With the procedures installed at MGG, we are now in a position to provide our customers exactly the same as what virgin suppliers promise – constant quantities of the same quality. The goal we pursue is a constant expansion of the offerings – this counts as much for each type of plastics as well as for the available quantities" , as Günther Höggerl explains optimistically.